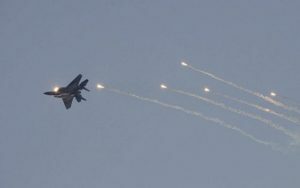 Syrian air defences hit another Israeli warplane. Syria’s air defenses hit Israeli warplane, intercept missiles targeting Syrian air base. The Syrian air defenses hit an Israeli warplane during an Israeli airstrike on Syria’s T-4 Air base in central Syria on Sunday, the Syrian army said in a statement on the state TV. The Syrian air defenses have forced other Israeli warplanes to leave the Syrian airspace after one fighter jet was hit and many missiles were intercepted, according to the report. The report didn’t give details about the targeted Israeli warplane. It was not the first one targeted as in February an Israeli F-16 crashed in northern Israel after being hit by Syrian air defenses. Meanwhile, the TV said six missiles landed in the vicinity of the base during the airstrike on Sunday, adding that damages were caused with no reports on casualties yet. The TV aired a cellphone video footage, showing the air defense missiles twinkling in the night chasing the Israeli targets. Israel has carried out several attacks on this specific air base in the past, claiming it was targeting Iranian fighters and weapons. Israel said that it won’t tolerate any Iranian influence in Syria. TAP. Israeli planes no longer invulnerable. The T-4 Air base was hit in April, and the attack was reportedly targeting Iranian fighters. But Syrian government officials repeatedly said that the targeted areas are Syrian bases and the soldiers killed were Syrians. This comes as the Syrian army is advancing in southern Syria in areas close to the Israeli-occupied Golan Heights, which sparked the ire of Israel. Israel fears a growing influence of the Iranian-backed fighters of Hezbollah in that area. Did Israel Bomb T-4 Base in Syria?